Ants in Massachusetts are common, with many different species finding their way to indoor locations. 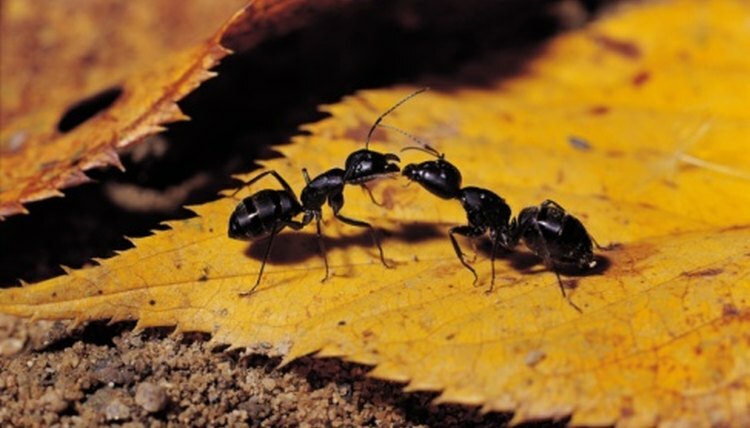 While they do not cause much damage to homes, ants can become major pests when indoors. They can occasionally bite, but more often they get inside homes and cause a mess, getting into trash and leftover food, and finding ways to get onto tables and counters. Carpenter ants are a common household pest in Massachusetts. Carpenter ants are black and shiny, and large in size compared to other ants. They range from one-fourth to three-fourths of an inch. The fertile male and female carpenter ants, commonly found in late spring or early summer, will have wings. Carpenter ants are known for destroying wood, and once inside homes, these ants will borough into the wood to create nests. They can slowly cause a lot of damage to homes but are more commonly found outdoors in areas where falling trees or decaying wood is located. Acrobat ants are also found in Massachusetts. Acrobat ants get their names from the way their worker ants carry there abdomen above the head and thorax. Most acrobat ants are one-eighth of an inch long, with the queen ant reaching lengths of three-eighths of an inch. They are normally light brown to black but can be multicolored. They are common outdoors where they nest under rocks, under logs, in firewood piles or in trees. When indoors, acrobat ants prefer moist wood or wood that is starting to have fungal decay. They will feed on dead and live insects. They will also feed on honeydew from aphids and mealybugs. Odorous house ants are found in Massachusetts, and they get their name because of the disagreeable odor that arises from them when worker ants are crushed. The odor has been described as similar to rotten coconuts. Odorous house ants are most commonly found nesting in soil outdoors under mulch, debris, rocks, logs and other things of that nature. They will live indoors in warm and moist areas, particularly in wall and floor voids. These ants are about one-eighth of an inch in length and are dark brown. They will feed on dead insects, sweets, meats and the honeydew from aphids and mealybugs. Pavement ants are one of the more common ants found in Massachusetts’ homes. They are small, with worker ants only being .1 to .16 inches in length. They can vary in color from dark brown to black. The reproductive ants are winged and about twice the size of the worker ants. Most colonies are located under sidewalks and building slabs. They often enter homes through cracks in foundation walls. They will eat many different types of foods including sweets, fruits, dead insects and small seeds. How Long Does It Take for Wasp Larvae to Hatch? How Deep Do Ants' Nests Go? What Are the Different Sizes of Roaches?